If a Soccer Goalie Has His Hand on the Ball Can a Player Kick It? 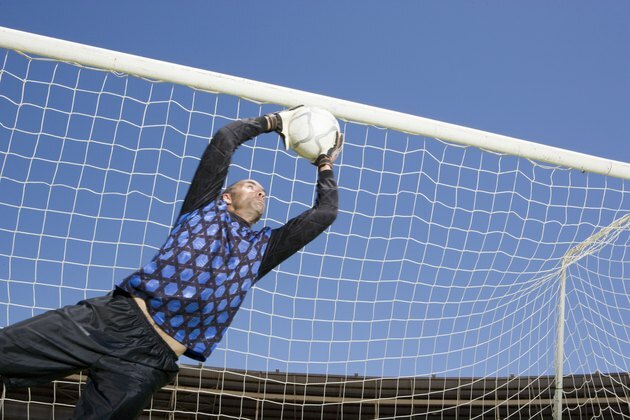 In soccer, the goalkeepers are the only players on the field with special privileges. While both deliberately playing the ball with his hands and arms and throwing the ball while in play are illegal for the other 10 fielded players on the team, the keeper is allowed to do both within the penalty box. Such privileges lend themselves to a variety of potential plays within the box that would not be allowed elsewhere on the field. FIFA's Laws of the Game serve as the basis for most professional soccer associations and tournaments worldwide, including Major League Soccer, Barclays Premier League and the FIFA World Cup. According to the FIFA Laws of the Game, handling the ball involves deliberately attempting to play the ball with your arms or hands. Though incidental contact is permissible, disciplinary actions for handling the ball usually involve a free kick for the opposing team. In cases where a player blatantly handles the ball to prevent the opposing team from gaining possession or attempts to score a goal with his/her hands, the offending player can be given a caution in addition to the free kick. If such blatant handling occurs with the obvious aim to prevent a goal, the offending player may be sent off prior to the free kick. In addition to deliberate hand or arm contact with the ball, playing the ball with an object held in or thrown from your hands also counts as handling the ball. While such rules apply to all players on the field, exceptions are provided for keepers within their own penalty boxes. The keeper is treated the same as any other player when playing outside her team's penalty area, with handling the ball just as serious an offense as it would be for the other players on the field. While in the penalty area, the keeper cannot commit a handling offense that results in a direct free kick, or a free kick that can directly result in a goal, as would be the case elsewhere on the field. Instead, handling offenses committed by the keeper in the penalty box result in indirect free kicks. For a goal to be scored off of an indirect free kick, the ball has to make contact with or be played by another player before entering the goal. If an indirect free kick is kicked directly into a goal, the keeper is awarded a goal kick and the goal is disallowed. When in the penalty box, the keeper is allowed to control the ball with his hands for up to 6 seconds. For keepers, controlling the ball involves holding it in your outstretched hand, trapping it against the ground, trapping it against your body, bouncing the ball or tossing it up in the air. The keeper is not allowed to control the ball again after deliberately handling or releasing it until another player has touched the ball. As a keeper, you are not allowed to handle the ball if it is passed to you by other players on your team, whether these passes are from kicks or throw-ins. If any of these offenses are committed, an indirect free kick is awarded to the opposing team at the point where the violation occurred. Can a Player Kick the Ball While the Keeper is Handling It? According to the Laws of the Game, neither a player on the keeper's team nor an opposing player can kick the ball while the keeper is handling it. As a keeper, the Laws of the Game state that you cannot be challenged by an opposing player while handling the ball. In addition, the Laws of the Game include violations for playing in a dangerous manner. This is defined as performing any action that may injure either another player or yourself, regardless of which team the other player is on. If you attempt to kick the ball while either your keeper or the opposing team's keeper is handling it, the Laws of the Game state that you must be penalized for playing in a dangerous manner. Depending on the desired outcome of this dangerous play and whether or not contact was made between players, this violation is penalized with a free kick, penalty kick or the offending player being sent off for the violation.